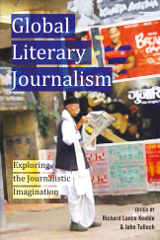 Global Literary Journalism (2012) is the ambitious effort of twenty-three accomplished scholars to explore the phenomenon of literary journalism – a field occupied by fact, fiction and reportage – worldwide. The volume makes for an interesting read, especially when it is received alongside John S. Bak and Bill Reynold’s Literary Journalism Across the Globe (2011). While the first section on the theory of international literary journalism of Bak and Reynold’s collection of essays could be seen as providing the theoretical basis of the case studies in Keeble and Tulloch’s volume, the second section about journalistic traditions complements the mostly synchronic studies in Global Literary Journalism and compensates, furthermore, for some of its blind spots (e.g. literary journalism in China, Eastern Europe and Africa). Global Literary Journalism is divided into five sections, consisting of case studies that deal with renowned literary journalists from a number of different countries: Ireland, Poland, Finland and Norway, to name but a few European countries, and authors from the United States and Canada as well as from Latin America, India and the Middle East. In the first section titled ‘Disputed Terrains’, seven scholars tackle the epistemological issues of literary journalism and explore the fuzzy boundaries between the literary and the journalistic. The five studies that make up the second section (‘Exploring Subjectivities’) are concerned with the problematic place of the personal in literary journalism, including, amongst other things, the conceptualization of the important role of the ‘I’-witness. The third section (‘Long-form Journalism’) deals with literary journalism’s contribution to war reporting. In the fourth section (‘Colonialism, Freedom Struggles and the Politics of Reportage’), partisan prose and the role of literary journalists in various political, anti-colonial and environmental campaigns are dissected. The last section (‘Transforming Conventional Genres’) comprises three chapters that discuss in how far the journalistic imagination can transform conventional genres (e.g. travel writing) and the extent to which the web can function as a catalyst of generic development. The five sections reflect the variety of both the forms and functions of literary journalism in a global context. “As a genre”, David Abrahamson and Ibrahim N. Abusharif write, “literary journalism finds expression across a diverse range of national and cultural traditions” (24). Global Literary Journalism is as much about the epistemology of journalism as it is about that of literary journalism. The contributors use literary journalism as a foil against which to assess journalism past and present. More specifically, literary journalism serves as a means with which to bring to light the limits of mainstream journalism – the discourse of distanciation and neutrality that is a symptom of what Michael Schudson (2001) calls “the objectivity norm in American journalism”. As the contributors convincingly demonstrate, literary journalism can be defined as a travelling genre that is characterized by a certain epistemological fluidity (sensu Hartsock 1999) since it is situated in “a field where different traditions and practices of writing intersect” (7). What distinguishes literary journalism from mainstream journalism is its literariness. But what exactly does the notion of literariness imply? Just as “journalism means many things to different audiences” (395), the literary dimension of literary journalism is also subject to controversy. Whereas Abrahamson and Abusharif argue that what makes literary journalism ‘literary’ is that it transcends the boundaries of time and space, Jenny McKay claims that literariness “depends on the reporter shaping the lives described so that they become ‘inventions’ to which the characters themselves might object” (183). Drawing on the work of the American writer Joseph Mitchell, Robert Alexander makes a plea for innovation and newness as literary qualities. Norman Sims, on the other hand, argues that the ‘literary’ has three supporting legs: It means that a work is well written, contains symbolic elements and expresses the personal connections of authors. In his analysis of Dexter Filkins’ literary work, Miles Maguire argues that “it is the form that appears to allow for the reporting of facts that might not otherwise have seen the light of day” (266). This argument contains the seeds for an understanding of literary journalism as a genre in which the semanticization of narrative forms (Nünning 2008) plays an essential role. In light of this, Terry Eagleton’s latest book The Event of Literature (2012) might, apart from Mikhail Bakhtin’s Dialogic Imagination (1981), provide ample food for thought also for literary journalism scholars. While these works might help to shed light on the notion of the literary, they have little to say about the other important modifier – the term ‘global’ – that the contributors grapple with. The notion has multiple layers of meaning: As pointed out above, global literary journalism refers to the academic study of literary journalism worldwide. Apart from the geographical dimension, the adjective evokes the idea(l) of a “global literary journalism faced with tackling global, rather than regional or national, problems” (334), thereby conjuring up the debate about the (in)existence of a global public sphere. Finally, the third layer of meaning refers to a writer’s public outreach which often extends beyond national borders. What is particularly striking in this context is the book’s overall celebratory stance, succinctly captured in the phrase: “Long live literary journalism (whatever it may be)” (18)! This exclamatory remark makes sense considering that the contributors associate a democratic outlook with the genre. But it should be taken with a grain of salt, for it forecloses a critical engagement with literary journalism. Apart from Alice Donat Trindade’s article, which throws a critical light on Pedro Cardoso’s literary journalism, most scholars argue for the inclusion of literary journalism into the Anglo-American canon. The reasons as to why literary journalism deserves a place in the Anglo-American canon are far from unanimous, though. The value of literary journalism is linked to what could be seen as the three broader cultural functions of the genre: Rupert Hildyard’s analysis of John Lanchester’s Whoops! Why Everyone Owes Everyone and No One Can Pay (2008) paradigmatically illustrates that literary journalism simultaneously functions as a ‘reintegrative inter-discourse’ (Link 1988) in the sense that it exposes how the financial crash subverts the free market ideology and reintegrates those discourses that have been marginalized over the last thirty years into the whole system of cultural discourses; as a ‘cultural-critical metadiscourse’ (Zapf 2001) in the sense that it holds to account the powers that be; and as an ‘imaginative counter-discourse’ (ibid.) in the sense that it rearranges our narratives and how we come to know. It is this unity in diversity as regards both the forms and functions of literary journalism that explains why anyone interested in global literary journalism should attend to this groundbreaking volume which makes a major contribution to literary journalism studies scholarship. Bak, J. S.; B. Reynolds (eds. ): Literary Journalism Across the Globe. Journalistic Traditions and Transnational Influences. Amherst 2011. Bakhtin, M.: The Dialogic Imagination. Four Essays by M. M. Bakhtin. Austin 1981. Eagleton, T.: The Event of Literature. New Haven 2012. Hartsock, J.: ‘Literary Journalism’ as an Epistemological Moving Object within a Larger ‘Quantum’ Narrative. In: Journal of Communication Inquiry, 23.4, 1999, pp. 432-47. Link, J.: Literaturanalyse als Interdiskursanalyse. Am Beispiel des Ursprungs literarischer Symbolik in der Kollektivsymbolik. In: Fohrmann, J.; H. Müller (Hrsg. ): Diskurstheorien und Literaturwissenschaft. Frankfurt/M. 1988, pp. 284-307. Nünning, A.: Semantisierung literarischer Formen. In: Nünning, A. (Hrsg. ): Metzler Lexikon Literatur- und Kulturtheorie. Stuttgart 2008, pp. 652-3. Schudson, M.: The Objectivity Norm in American Journalism. In: Journalism, 2.2, 2001, pp. 149-70. Zapf, H.: Literature as Cultural Ecology. Notes Towards a Functional Theory of Imaginative Texts, with Examples from American Literature. In: Grabes, H. (ed. ): Literary History/Cultural History. Force-Fields and Tensions. Tübingen 2001, pp. 85-100. 1 Pings/Trackbacks für "Richard Lance Keeble, John Tulloch (Hrsg. ): Global Literary Journalism"
Nora Berning is the coordinator of the European PhDnet ‘Literary and Cultural Studies’ and a member of the research and management team of the International Graduate Centre for the Study of Culture (GCSC) in Giessen, Germany. She is the author of Narrative Means to Journalistic Ends (VS Verlag für Sozialwissenschaften, 2010). While Nora’s dissertation Towards a Critical Ethical Narratology (Wissenschaftlicher Verlag Trier, 2013) reflects her strong interest in interdisciplinary approaches to the study of narrative, she has also published widely on literary journalism and genre theory. Nora is a current habilitation candidate of the Department of English and American Literature at Justus Liebig University Giessen (JLU) with Prof. Dr. Ansgar Nünning.